all our production is Sussex Based from sheep to spinning and finished products. We are so lucky to have Diamond Fibre Worsted Spinning Mill only a few miles away - a truly talented and hands-on small-scale production. All our talented makers and knitters live locally too. 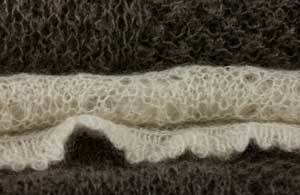 Wensleydale Longwool is acknowledged to be the finest Longwool in the world with a unique structure and lustre. When this is combined with the worsted spinning process the result is stunning. 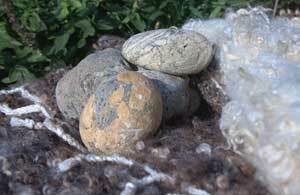 The Wensleydale fleece is like no other: no guard hairs or Kemp wool, no alteration in substance from belly to back which makes every lock usable once it is graded for purpose. our yarns are produced in very small quantities!! Once it is gone it is gone and every run is different. We make for the discerning client who values quality above quantity. 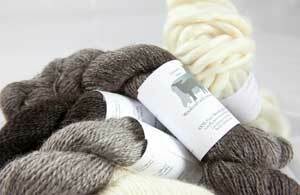 All our products are 100% unblended Wensleydale wool. 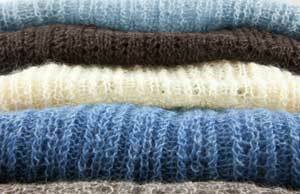 Only the best quality fleeces or even just parts of them go for worsted processing. In order to make up enough fibre, we also buy in some fleeces from other local Wensleydale Breeders whose flocks are well known to us or who have shared in our Breeding Up Scheme to re-generate the Gene Pool of Black Wensleydales. When you buy one of our products you are helping to conserve Black Wensleydale Longwools as well as the Beech Hill Flock. Fine/Lace Weight: this plied yarn runs out at nearly 400 yds per 100g. 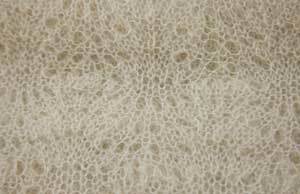 We use it for Shawls, Shrugs, light Sweaters, Socks etc. Double Knit/DK: this plied yarn runs out at nearly 300 yds per 100g. This yarn is ideal for Scarves, Gloves, Tank Tops, heavier Sweaters etc. DK Plus: this plied yarn runs out at nearly 200 yds per 100g and is twice as thick as the Fine . We use it for Scarves, Throws, Children'sTank Tops, Jackets etc. NB Wensleydale is cool to the touch and warm to wear - you do not need it to be over thick or heavy even in winter. Combed TOPS comes in all four colours in 100g quantities. Washed Locks for Handcrafters in 25g to 100g packs. These are approx. 5 - 7 inches long because we clip our sheep twice a year. This gives us the best fibre colour and quality. We also provide our own Patterns if you would like to know more.